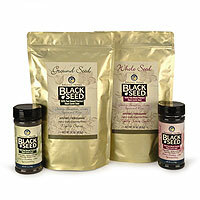 We are pleased to offer 100% pure Black Cumin Seed (Nigella Sativa) in Whole Seed and Finely Ground "Whole Spectrum" Powder that can be used as a seasoning, added to beverages such as smoothies and juices, brewed as a tea or can be filled in capsules and combined with other herbs to be used as a dietary supplement for humans and animals. It's a rich source of fiber, essential fatty acids, protein and other vital nutrients found in Black Seed. Our Black Cumin Seed (Black Seed) is NON-GMO and organically grown in Turkey, not treated with pesticides or irradiated.